South Energyx Nigeria Limited, the developers and planners of Eko Atlantic City, Nigeria’s premium smart city situated adjacent to Victoria Island, has partnered with Fine and Country West Africa for the Refined Investors Series 2017, scheduled to take place in London, the United Kingdom on October 6th and 7th, 2017. 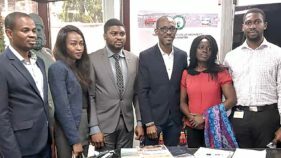 The event, which is the leading premium real estate forum, is themed “Taking Nigeria to the World” is targeted at Nigerians in the Diaspora and other international investors. The Reﬁned Investor Series UK is a premier event focusing on unique real estate opportunities in Nigeria that are safe, secure and highly sustainable. The event also targets aﬄuent and high net worth individuals and astute investors in the Diaspora. The series aims to celebrate the best of Nigerian real estate. During the forum, Eko Atlantic City will be exhibiting to showcase the expertise that has been put into the building of the global city of world class design which has been predicted to be the next financial capital of Africa. Also, the documentary video that depicts milestone of the city as a blend of infrastructure, engineering and technology will be shown to the audience. Eko Atlantic’s smart planning showcases the best in urban design and is divided into 10 distinct ( for phase 1 & 2 only) connected with modern and efficient transport systems integrated with the Lagos waterways. The Business District is home to the future financial hub of Africa and covers 700,000 square meters of prime real estate. The city will fulfil the residential needs of Lagos state, while also catering to her commercial needs. Other highlights of development in the city at the moment include the completion of 14 bridges, the Great Wall of Lagos which has reduced the ocean surge into Victoria Island and environs, and the completed Eko Pearl Towers, amongst others. The City has a state-of-the-art 24/7 infrastructure network, including 21st-Century communications system, quality road network and uninterrupted electricity supply, making it a compelling place to live and work. Upon completion of the city, Eko Atlantic will accommodate about 300,000 people as residents while 200,000 individuals are expected to commute to the city on a daily basis either for work or business transaction.